Inspired by the timeless style of the 1950’s barbershop and its spiritual founder, Willy “Uppercut” O’Shea. 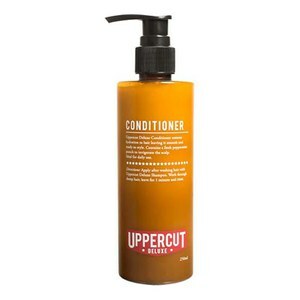 Uppercut Deluxe is a modern, yet traditional approach to men’s grooming. Uppercut was born through two childhood friends, Luke Newman and Steve Purcell and their frustration of using mediocre products at their barber shop. The products at the time didn't suit their style and were more geared towards the man's wife rather than the man himself. This fueled the boys to create something they would use and be proud to promote. They experimented with different formulas alongside their chemists for over a year before they were happy with their first product, and now international best seller: Deluxe Pomade. An Australian born brand proudly made with only the finest ingredients, Uppercut Deluxe delivers a core range of high quality grooming products for men without all the fancy embellishments of salon brands. What makes Uppercut Deluxe unique is that the boys are barbers that use the product everyday and constantly challenge themselves to create timeless products that guys can use for their lifetime; it's about the essential grooming items. Uppercut Deluxe, maintain their commitment of creating the highest quality products that will go the distance and give you that knockout look!